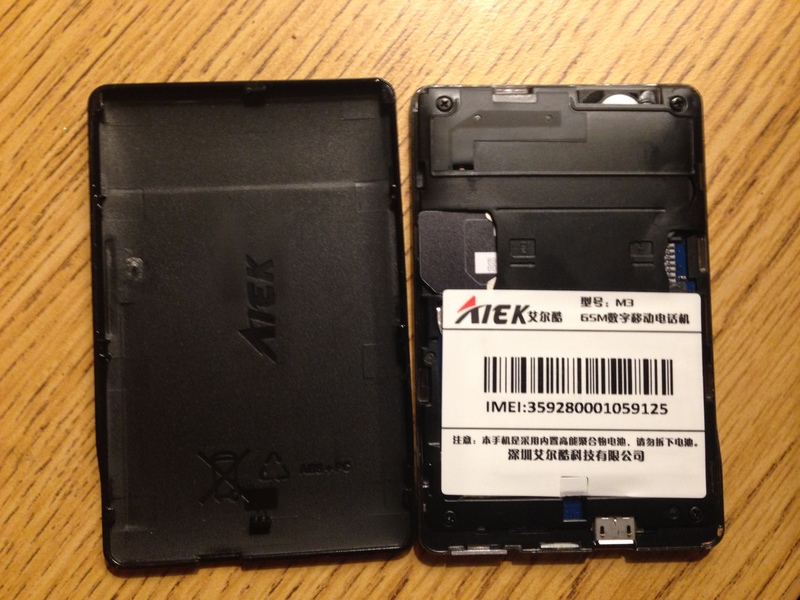 The Aiek M3 is a quad band GSM phone which is exactly the same size as a credit card (but significantly thicker). It is the next generation following the older “real button” versions (M1 and M2) and instead uses some sort of capacitive touch key design. Aesthetically it doesn’t look too terrible, with some nearly real metal at the top and bottom. The one button also has a nice click to it. The screen is an exact copy of the old LG VX6000 external screen, and even features two colors. But they can’t be used at the same time — the bottom 75% of the screen is blue and the top 25% is yellow. Very cute. The mini SIM and micro SD slots. Remove the back cover by sliding it up the phone. It should easily click out. 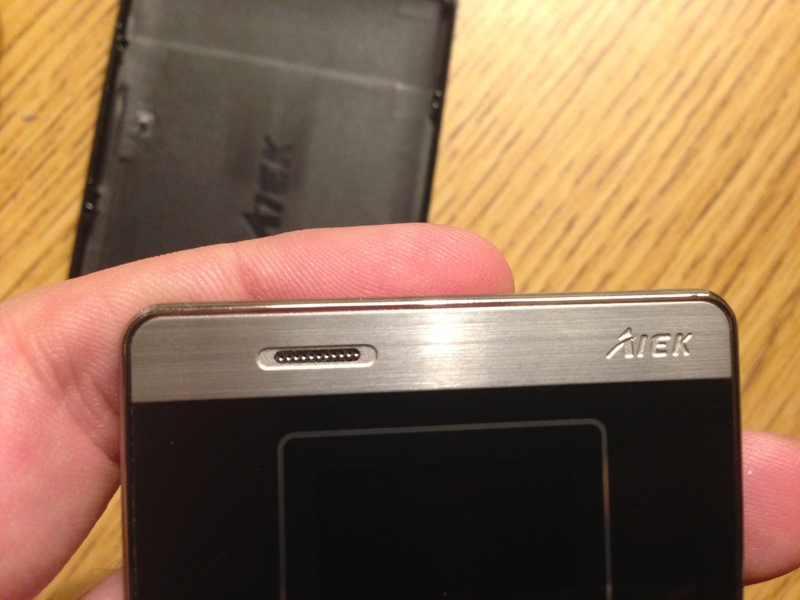 The Aiek M3 takes a regular “Mini SIM card” and not a micro or nano sim card. Just slide it in the side tray. There is also room for a microSD card to store music. Switch on bottom must be turned to the ON position. Press and hold the only button the phone, down by the microphone. The phone will make a cute but incredibly annoying noise as it starts up. Short pressing the button will toggle the screen on or off, and the screen has an auto shutoff. The keys deactivate when the screen shuts off. The button must be pressed again to reactivate. Long press will shut the phone off, with an equally hideous noise emanating from the phone. If you’ve used other cheap, crappy, Chinese cell phones, you’ll immediately note that this phone runs the exact same operating system with the same menu options as all the other phones. This includes the BLU style “must confirm everything with a two click process.” For example, to edit something you must press Options->Edit and then to Save it you must press Options->Save. To make matters worse, this is not consistent throughout the phone. “Add a New Contact” is at the top of the contacts list under “A”, and you must scroll up to get to it. In most cases pressing “Back” unceremoniously discards all of your changes to the current screen, but on several screens this is not the case. Enjoy figuring it all out! The included earpiece speaker is mediocre, and you can here some interference just when using it at my desk (with another cell phone in somewhat close proximity…). The text input method defaults to “Ying Yang Chinese” or something like that. Changing it requires morse coding your way through the 8 different options using the # key. It also has no automatic “first character of sentence is upper case and rest is lower case feature.” Switching from upper to lower requires one press from ABC mode to abc mode. Going back, on the other hand, requires going through all other modes (numeric and Chinese). It includes the usual Media Player, FM Radio, and Calculator. Unfortunately, the media player is only functional when you plug in the included headphones as there is no speaker to speak of (hah). By all intents and purposes this is a god-awful terrible cell phone. But at ~$40 shipped from China (and equipped with Quad Band GSM radios), it makes an excellent “slip into the wallet back up GSM phone.” Makes a good conversation starter. it is possible that there may be 900/1800Mhz dual band versions of the phone not suitable for the US out there as some sellers are claiming this specification, and are advised to confirm frequency support. Curiously, the certificate for testing RF emissions on the manufacturers product page is for 900/2100Mhz which may indicate the 850/1900 is not supported and sellers may not know what the phone supports. It’s possible that the frequency specifications are as you suggest (as I’m in the US right now and haven’t acquired my OpenBTS cell tower yet, I can’t confirm that it will work on non-US bands). I’ve updated the article with an audio recording. Check it out! I haven’t come across any sellers selling 850/1900 phones, so I would expect there should be little risk of the genuine phones not working outside of the Americas. However, it seems there are clones of the phones out there including one with a colour LCD and it is conceivable that 850/1900 only phones will be produced by clone makers or Aiek if the phone becomes popular in the US and a production of an America models saves the manufacturer a few bucks. Non-chinese speakers may prefer the more difficult to mind and slightly more expensive Mooc M33 version of the phone, which I am inclined to believe is also produced by Aiek. 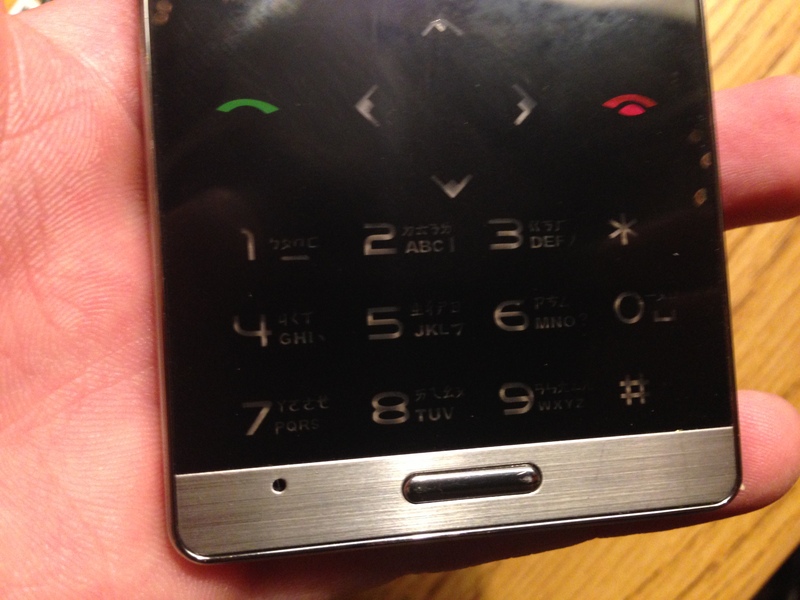 This omits the Chinese character line from the keypad. and shifts the symbol graphic symbol above the letters. The letters may also be slightly larger. 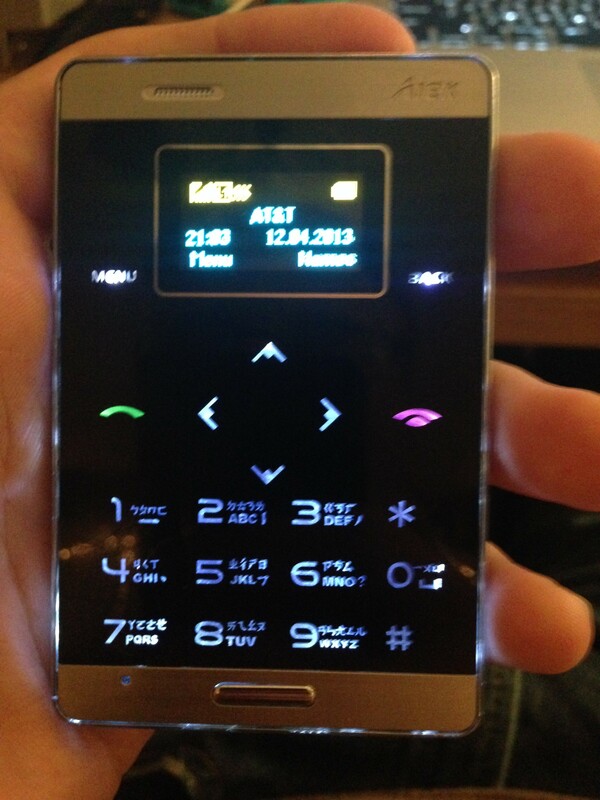 I have also seen a dual SIM version of the phone. I have no idea whether this is genuine – battery life would be a concern as well as its SIM management capability. Interesting, but too much of a risk I believe. Interesting. I’ll have to take a look. Unicode support on the phone is excellent though, far exceeding the larger BLU phones clearly based on the same OS. I just bought one and it received a call on Roger’s in Canada, which is 850/1900. However, I would like to see a manual. Didn’t believe when I read the reviews at Amazon which said they had a hard time figuring it out. Thought it would be a snap. I sold cells from 1996 until 2012, and thought I’d seen it all. I was wrong. This switching into lower/upper case is? I used 23 1/2 steps to enter one name using first letter capital, then lower case. I’m done. It is little. Not particularly cute. Fits in my purse. Not sure if I actually get that “secure” feeling by having it……..
It’s cute! I like it. It’s simple talk and text, if you’re simple and you’re practical like me, you’d like it. BTW thanks for the review! I was wondering what kind of simcatd it took. Not the nano hufff… Good for a back up phone, or to give to kids. I’d be wary of buying a GSM phone these days as some carriers have announced plans to withdraw 2G service while others have reduced quality of the service without announcement to free up existing bandwidth for 3G and 4G. You might get plenty of use out of one of these before a shutdown though, possibly even better service than carriers that haven’t announced plans depending on how much demand they have for the spectrum they’ve licensed. If you want separate calls + data SIMs, I reckon a dual SIM phone that can swap the slot functionality is better as it can also give you the better network technology for calls when data is not in use. 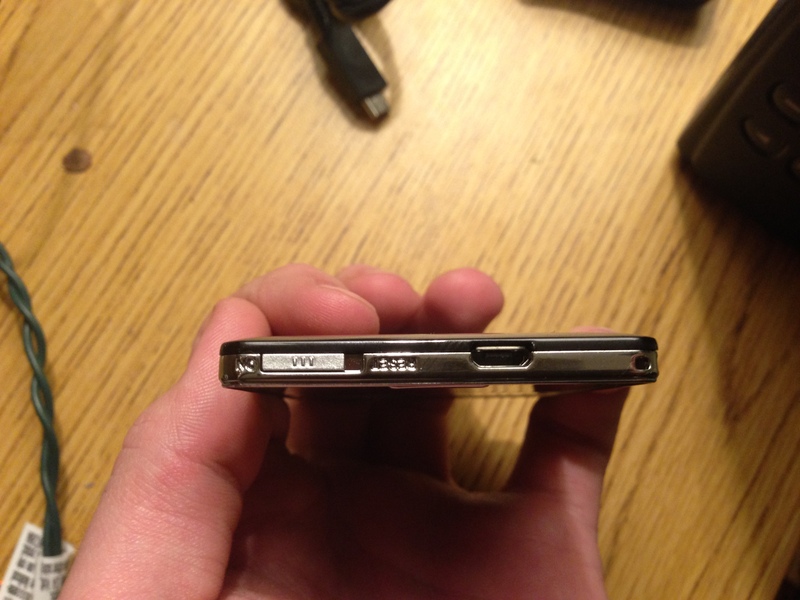 An alternative here, is a dual SIM adapter suitable for some phones. If you don’t care about whether you use 2G or 3G for calls or text, a separate phone will ensure you can still make or receive calls when using data. BTW, contrary to my post above the Mooc brand is unrelated to Aiek. It seems it is batch dependent whether you get a 2 band or 4 band one. I’d consider buying a 3G card phone but 4G offers the prospect of better quality calls in addition to higher speed data. It will be a long time before they remove 2G. There has always been a push to get people to move because the service is crowded, but they still actually have ANALOGUE in a lot of places simply because the signal is so much longer range. CDMA, as well, will remain (for the same reason), in less congested areas. The more customers transferred over to 3G, the less likely 2G is to be overwhelmed. One caveat in this is that they may decide (when transmitters need repair) to discontinue maintenance of 2G in heavily populated areas where coverage is layered, so larger centres will be the first to go. I would argue that range depends more on transmission frequency rather than analog or digital mode. I won’t speculate when North American carriers will finally switch off 2G it depends on their respective business cases, but low end frequencies are particularly valuable and LTE is more efficient the GSM. One barrier though are the low-bandwidth 2G devices remaining other than handsets that need upgrading and the lucrative revenue stream from M2M devices which consume tiny amounts of bandwidth. My phone keep asking to insert sim card when I already put one normal sim card.